Donkeys have been the most surprising creatures I’ve ever encountered. Having no previous exposure to livestock but for the occasional pat of a snout here and there, I wasn’t sure what to expect when we adopted Bunny and subsequently, Tee. 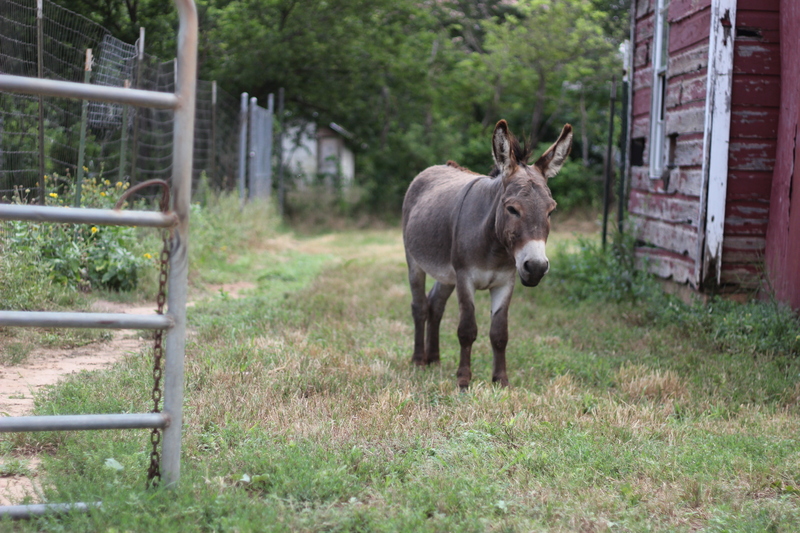 What King Ranch and I are learning is that the donkey is not only loyal, loving, and highly intelligent, but they are a species that demand respect. It’s a heavily humid Friday afternoon with absolutely no movement of breeze or solace from the sun. I just can’t wait until the evening, however, to take our friend Nikki (who is visiting us from Nashville this weekend) out into the pasture to meet Bunny and Tee. It’s always an exciting and proud moment for me – introducing our donkeys to new visitors. They never fail to deliver. We usually get a loud bray or two, an enthusiastic trot, and plenty of snout snuggles. A few carrots in hand and our boots slipped on, I lead Nikki through the backyard with Little Foot on my hip. Thing One and Thing Two are frantically scrambling at our feet as I unchain the lock around the gate that leads out into the pasture. The lock hits the gate with a metallic clang as I slide it open, motioning for Nikki to go ahead of Little Foot and me. The sounds prompt Bunny to bray and I become giddy. Two steps into the pasture and at our feet is a dead rooster. If you’ve been keeping up with my stories, you know that we’ve had our share of bird death here at the ranch. There was the egg-laying hen who hopped the fence and fell victim to a hit and run. Then, there was the chicken (who was likely mangled by some predator) that crawled to the back of the coop in an effort to find comfort as she passed. This death, however, is clearly the doing of one of our donkeys. Sparing you, reader, the grim details, I will only say that the rooster’s head has clearly been stomped. The flatness of his skull and hoof marks all around his body, I believe, proves this hypothesis. I ask Nikki to take Little Foot into the backyard as I retrieve a shovel. This will be my first burial – King Ranch has taken care of the previous two. I find what I think is a nice spot to eternally rest underneath a pecan tree. The ground is dry and difficult to pierce with the shovel, so I force all my weight into it – sweat running from my hairline and dripping into my eyes. 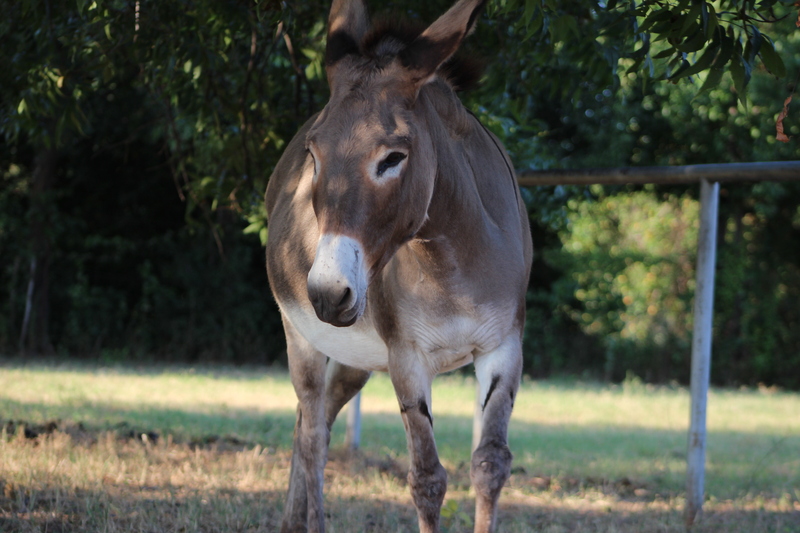 I wonder how this could have happened – why one (or both) of our sweet donkeys would stomp a rooster to death. Lately, the roosters have become more comfortable with all of us and instead of keeping a safe distance, they clumsily (and annoyingly) scatter beneath our feet as we walk around in the pasture. Likewise, I’ve seen the roosters bouncing around the donkey’s hooves, especially when we’re out there giving them treats. My guess is that this particular rooster startled one of the donkeys and the rest is, well, about to be buried in this hole I’m trying to dig. I stop digging for a moment and look back at the donkeys. They seem perfectly peaceful, grazing and flicking their tails. Since we’ve been here, I have gazed into the eyes of the donkeys, talked to them, brushed their coats, and fallen in love with them. What I haven’t given much thought to, however, is how at any second, they could end my life with one forceful movement. I recall a headline that King Ranch and I once saw that read, ‘South Texas Mayor Killed in Apparent Donkey Attack.’ Donkeys are dense and solid muscle. I’ve described before how they’re bred to protect against very dangerous predators. Humans, I imagine, really don’t stand a chance to a perfectly placed buck of their back legs. As I’m standing here with my forearms crossed over the top of the shovel, they look different – the donkeys. These adorable and gentle creatures who I have come to know and love now look mysterious to me. The muscles in their hind legs are well defined and their ears are straight up even as they graze, indicating to me that they’re always on alert. Their eyes are always wide as if they’re seeing everything. Uncomfortable, I dig some more. As I’m stomping on the shovel and becoming frustrated with the heat and this hole, I get the overwhelming feeling that the curtain on this ranch life is falling down and that all the love and warmth and magic has been shattered into just another anxious place filled with uncertainty. This love-fest I’ve been soaking in since moving here now seems tragic and full of danger. We’ve seen massive and highly poisonous spiders, snakes and heard stories of bobcats roaming around. Everything suddenly feels very dark. Finally, the hole looks deep enough, so I walk back across the pasture dragging the shovel behind me (which feels quite heavy now) to retrieve the dead rooster. Bunny and Tee lift their heads from the grass and follow me with their gaze – their gaze that I’m trying to better understand. Over the fence, I see Nikki bouncing Little Foot up and down in her arms on our patio and I feel guilty that she has had to witness this rooster tragedy. 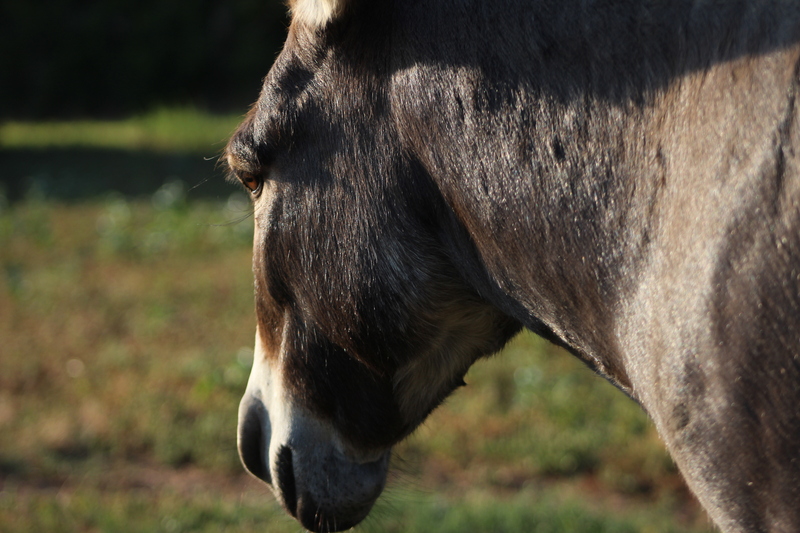 This guilt quickly turns to frustration – of all the days, the donkeys had to do this when someone else was here. This whole fairy tale I’ve been living in and hyping up has been exaggerated by my imagination and story telling; surely Nikki and everyone else thinks I’m living in a dreamland that only I can see. The shovel is just large enough to scoop up the flat, floppy rooster; his smashed head dangling over the edge. This is the worst. This poor, pathetic, dangling bird already smells like death. Back at the hole, I realize that I have not made it big enough to fit his body. “God d*mmit!” I yell, tossing the whole shovel to the side, the rooster flopping off of it. Everything is bubbling to the surface. The death. Dripping sweat. The heat. The hole. The dark side of the donkey. The beautiful façade of this whole ranch life fading away. Hoping Nikki hasn’t also seen my meltdown in addition to the grim corpse, I turn away and stare at the line of trees that tower along the perimeter of our property. Fighting back tears, I hear a snort directly behind me and as I turn, Bunny noses the back of my elbow and drops her ears back. Tee is quickly trotting over as well. I squat down and place a hand on each of their noses. Both sets of their eyes are completely focused on me – their deep brown irises surrounding black, horizontal pupils that sink in a million miles. They are curious right now, I can tell: their eyes searching mine. They must feel my frustration. My grief. My confusion. I’d like to think that they didn’t mean to kill the rooster – that it must have been an accident. But honestly, I believe that it was intentional. Perhaps the rooster pecked one of their legs, or squawked suddenly. Any sort of surprising behavior could easily cause a donkey to become defensive. I can’t really blame the donkeys for that. I stand up from my squat, pick up the shovel, and make the hole a little wider. Bunny and Tee stay close as I scoop up the rooster and gently lay him in the hole. I stand here for a moment, studying the pile of feathers that are the color of fading oil on concrete. “Rest in peace, little guy,” I whisper and begin to cover his body with dirt. I’m not sure if guilt is an emotion that donkeys feel, but right now, their closeness, stillness, and silence makes it seem as if they do. They made a mistake and maybe they realize that. Or maybe not. Either way, they’re right here and something from their demeanor is demanding my understanding: like the gravity of their complexity has tugged me more closely into their emotional orbit and I’m left trying to navigate blindly. In one afternoon, they have become so much more complex than I’ve ever realized. Aren’t we all incredibly complex? I spend a lot of time thinking about how important it is to be kind, honest, gentle, and loving. We were all taught ‘The Golden Rule’ in school – “Do unto others as you would have them do unto you.” In this endeavor to love, accept, be kind, and do unto others, however, I have often ended up in situations where I’ve sacrificed my own feelings and well-being just to avoid the risk of hurting someone else. Even when I’ve been called names or taken advantage of – I typically just look the other way because I know I have the strength to bounce back. I’d rather take on all of the hurt and deal with it instead of risking confrontation with someone. The truth is, though, I spend a lot of time frustrated, angry, and upset. I bruise incredibly easily and I don’t always have the strength to take on other people’s faults and bounce back. Perhaps this is one of the reasons I struggle so badly with anxiety – I’ve spent a lifetime collecting everyone else’s feelings like a massive satellite collecting and downloading emotional data instead of protecting or recognizing the fragility of my own. I’ve tried to bury my anger, fear and frustration instead of acknowledging and embracing those emotions as an equally beautiful and respectable part of my being. We are all light and dark. We’re happy and sad. We’re relaxed and stressed. We’re calm and fearful. All these feelings working together are what make us alive. Anger, fear, and frustration are part of life and are tools that can be used to protect ourselves and others. They help us learn about each other and help us grow as individuals. I finish covering the rooster with dirt and give the ground a pat with the back of the shovel before turning back to the donkeys. They’re now pushing each other out of the way for my attention. I am humbled by their complexity. As their owner, I am responsible to care for them – the entirety of them – light and dark and as much as I adore them, it is essential that I handle them with proper care and caution because they are much stronger than me and in ways, much more fragile. Lucky for us, I believe my love for them has earned me their loyalty. At least I hope so. Back on the patio, Nikki and Little Foot are bouncing and chatting. I tell Nikki that I’m sorry she had to see that, but she’s not the least bit bothered. My disappointment that Nikki didn’t walk into the peaceful paradise that our ranch has been thus far has turned out to be a completely unnecessary worry on my part. Perhaps instead of this being a crashing of the curtain, it’s actually a sneak peek into the ranch becoming more real. Like me and like the donkeys, the ranch is light and dark. Life is light and dark. The sun rises but then it sets. None of us would want it any other way. In the end, I suppose it all boils down to balance between the light and the dark sides of everything: ourselves, our pets and our surroundings. Be kind, but stand up for yourself. Be brave, but be cautious. Be happy, but also allow yourself to be sad if the need arises. Be giving, but don’t be careless. The donkeys seem to get this concept. They are so gentle, loving and loyal, but they also protect themselves and stand their ground. It’s why donkeys are considered to be so stubborn sometimes – they refuse to put themselves in what they perceive to be potentially dangerous situations. They sure do, however, go out of their way to love and protect us. I intend to do the same for them.